Andrew Purnell is an innovator and head of Ecocentric Design at Future by Design in Cape Town. He is an innovative and strategic thinker with a broad skillset and experience that extends from rural communities to the corporate board room. He has a particular focus on corporate impacts and dependencies on the environment and how corporates can innovate in the area of environmental management and sustainable development. His strong social and communication skills have allowed him to become an effective facilitator and developer of complex multi-stakeholder projects. 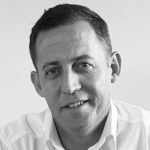 His practical hands-on and get-it-done approach, coupled with leadership experience and strategic insights enable Andrew to make valuable contributions in a wide range of business applications. With a B.Sc Hons in Zoology and Sport Science, Andrew’s career journey has allowed him to gain expertise in the fields of community development, emerging market entrepreneurship, corporate responsibility, biodiversity conservation, environmental management, the biodiversity economy, innovation and marketing. This broad expertise is augmented by experience gained from fulfilling a range of roles including grass roots implementation, project management, business management, leadership and consulting. Andrew’s vision is to make significant contributions in the field of socio-economic and environmental development so as to ensure the sustainable functioning of natural ecosystems that support human society and economic growth.